The concept is intriguing — gather the world’s best blenders and manufacturers, give them a ceiling of $5.00 per stick MSRP, a single format measuring 5.75″ x 54, and turn them loose to create the best long-filler cigar possible. The result is arguably the most ambitious of all house brands, the Cigars International Legends Series. 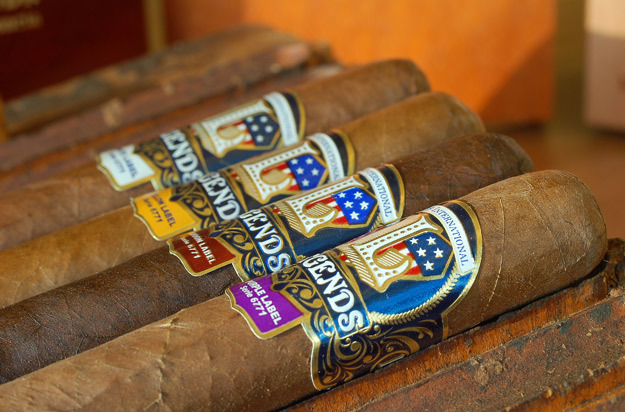 The 2005 launch featured color-coded entries from four manufacturers — Puros Indios, Perdomo, Camacho, and Manuel Quesada of MATASA. In the ensuing years, the roster of Legends has swelled to 11 with the inclusion of Cusano, Pepin Garcia, Drew Estates, Nestor Plasencia, Graycliff, La Aurora and Rocky Patel. With primary colors spoken for, they’re now reaching deep into the Crayola box. Gray, copper and maroon are the most recent additions. Periwinkle and raw umber can’t be far behind. I regularly see new smokers and bargain hunters seeking opinions of these on Cigar Live. And why not? At an average price of $3.00 per stick (often cheaper on CI’s auction site Cigarbid.com), the hope of striking gold on the cheap is irresistible. The announcement of a Graycliff entry quickened pulses. After all, the notion of a factory first Graycliff at three clams a throw is big news. Nothing else from the Bahamian factory is attainable for less than a car payment. Unfortunately, it was also the disappointing performance of the Purple Label that spoiled the reputation of the entire Legends line in some circles. Those expecting a “real deal” Graycliff were sorely let down. As we know, bad news spreads faster than good. The Purple Label is pale with a gritty wrapper texture. It begins with light spice and a nutty, amaretto-like finish. There is a one inch “sweet spot” around the one-third mark that is excellent. Right at the point at which you get intrigued, the flavor vanishes. The second half is ashy and increasingly bitter. I usually pitch these after about 30 minutes to spare myself the frustration. Age helps take the bite out of the second half, but they’re still a letdown after the impressive start. Don’t expect a Camacho Corojo here. In fact, the White Label doesn’t resemble anything I’ve had from Camacho. It is papery at the start but settles into an earthy, nutty and medium-bodied groove by the haflway mark. It is very Honduran, so if earthy isn’t your bag you should skip this one. It is one-dimensional and unbalanced. But it’s never muscular enough to turn unpleasant, either. Construction is above average with a full, easy draw. I enjoy the White Label as a change of pace. A thoroughly respectable smoke, though it doesn’t hold a candle to the old Camacho H Series, which I only mention because the H can also be found in the $3.00 per stick range. Nestor Plasencia’s Maroon Label is the most recent addition to the Legends line. It is a handsome, oily Connecticut Broadleaf-wrapped smoke, but without the heavy veining typical of the CTBL. The more I smoke the Maroon Label, the more I like it. It is sweet, almost syrupy at the start. But after a few minutes, spice and earth roll in to bring the flavors into balance. By halfway, it is surprisingly complex. Still predominantly sweet, but with an earthy and leathery backbone. (For those who have tried the 5 Vegas Miami, imagine that smoke cloaked in CTBL.) It never gets beyond medium strength. The draw remains cool despite a quick, uneven burn. I suspect the Maroon Label might be a “love it or hate it” kind of smoke. For just under $2.00 per stick at auction, I’m planting my feet in the “love it” camp. This one is the show-stopper. As a raving fan of all things Pepin, the idea of a $2.00-$3.00 DPG had me at hello. If you’re anticipating something similar to his fuller bodied Blue or Black lines, you’ll be let down. But if you enjoy his lighter fare like the Nacionales W or Padilla Achilles, the Yellow Label will be right up your alley. It is a smooth, medium-bodied cigar with a leathery core. Peanutty notes intensify as it becomes richer on the second half. The smoke has a dry character that bothers some, but I don’t mind it. Build is first rate, though the wrapper is fragile. You may notice some splits if your humidor suffers RH fluctuations. The Yellow Label lacks the complexity of DPG’s upmarket brands, but it’s a very good blend that suits any time of day. I love these with morning coffee. After my first five-pack, I bid on box after box at $40 and $43. I’ll be smoking my “winnings” until I’m in my sixties. Nice post…Ironmeden and I have reviewed these for years, but we kind of gave up on the line and haven’t even bought the Maroon label after having the utterly nasty Drew Estate on…I think it’s Copper. Anyway…our favorite has always been the Blue label my Matasa. In fact, it was Iron’s Cigar of the Year a few years back. I always thought it would be cool if a B&M shop carried them all for fans of the various makers to try something different. I might have to try a 5 pack of the Yellows now at your rec. This is why I love reading cigar reviews. It saves me time and money and shortens the odds of me getting a bad cigar. Thanks for profiling this series Kevin. I’m in the same boat, Lisa. I can’t tell you how many times I was about to take a shot on some smoke I hadn’t tried, then read a couple of reviews that made me think twice. I suspect it’s saved me a few bucks over the years. Ooh…forgot about the Orange label. That is my favorite, which is funny because as I know you’re read recently on our site, RP is not my favorite cigars. But the Orange is my personal fav in the line…Iron loves the Blue and I would rank the Blue second and the Black third. The Perdomo one is fun because it’s the only torpedo. You and Iron take care of those colds, get well soon! I am actually finishing up the “Sampler Pack” right now, with the Yellow label as the finale. I’m a novice cigar man, and value these kinds of reviews. I have to tell you, though, that I had to toss my Black label after about five minutes because the draw was extremely (read: way too) easy and it burned down very quickly. The rest are respectable smokes, and great for everyday consumption. Thanks for your comment, DareGr8. I haven’t had the Black Label La Aurora yet, though it’s my understanding that they are kinda middle-of-the-pack. On the rest of the line, I agree — “respectable” puts it about right. One is outstanding (Yellow), two are quite good (Maroon and White) and the others fit into that “fine for the money” category.